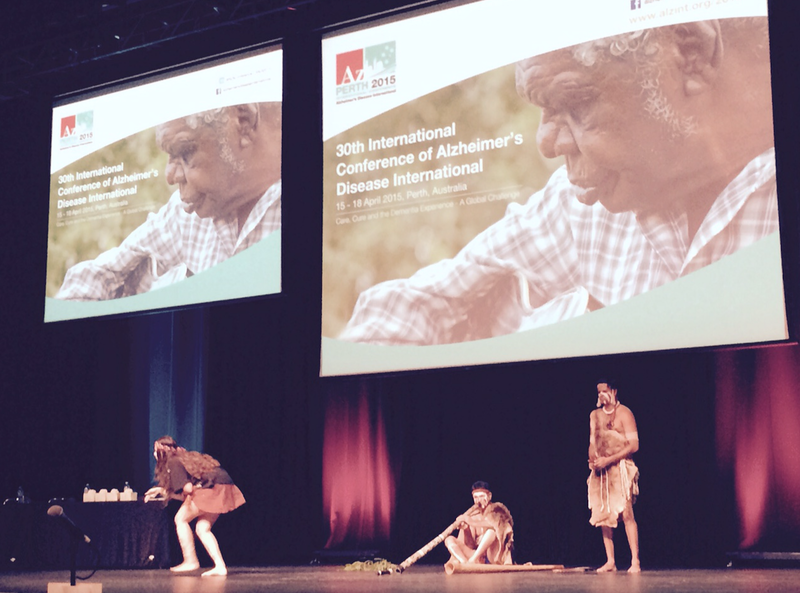 Over 1100 attendees representing 49 different countries were welcomed to the 30th Alzheimer’s Disease International conference in Perth on the 16th April 2015. Over the course of the three days delegates had the opportunity to attend over 40 different presentations relating to the latest developments in diagnosis, treatment and care, as well as hear some of the experts in the field. Significantly, 10% of the registered delegates were people with dementia, hence there was also at least 10% of the delegates were supporters of PWD. This was the biggest conference Alzheimer’s Australia has ever hosted, and the highest number of consumers ever to attend an ADI conference. Day 1 opened with speakers from Australia, Edie Mayhew living with YOD and her partner Anne Tudor, a poignant presentation Younger Onset Dementia: Our Bitter sweet journey. He reminded attendees that the current global cost of dementia is US $600 billion or 1% of global GDP and every four seconds a new case of dementia is diagnosed. So how do we reduce this number? Mr Wortmann explained that Alzheimer’s Disease International is advocating for all countries to set up national dementia plans and public health approaches to fighting dementia and welcomes the work of local Alzheimer’s advocacy to achieve this. Marc also said to keep an eye out for two reports being released later this year by Alzheimer’s Disease International updating on the number of people living with dementia around the globe, as well as the global cost of dementia. Along with this he also said there would be a special report released specifically focusing on women and dementia. I spoke about dementia friendly communities in general, and my work in developing and consulting on dementia friendly community projects around Australia and globally. A dementia friendly community is about respect, equality, accessibility, autonomy, inclusion and supporting our disabilities. I was heavily involved in implementing a dementia friendly community in a coastal NSW town of Kiama and she told us the key steps to developing this initiative was to establish a local advisory committee of people living with dementia, along with making sure the initiative supported local organisations and businesses to become dementia friendly. “I am still valuable, I am me! – I don’t want to be a victim of dementia I want to be the VICTOR!” said Ms Rohra. Ms Greenwoods presentation outlined the importance of consumer directed care and training staff to create relationships with individual residents. She explained to attendees that after implementing this initiative there was a significant reduction in injuries, falls, and other illnesses among residents, she also said the facility has had a 100% reduction in complaints and a 44% increase in compliments. Daniella is presenting at the Dementia Alliance International monthly online Cafe Le Brain on May 15th, for those of you who would like to hear more about her work, and its impact on improving the lives of people with dementia. The last day of the conference saw sessions focusing on new research into Younger Onset Dementia (YOD) as well as engaging people living with dementia and improving their quality of life. Today’s presentations had a focus on how society can best support and include people with dementia in everyday life. Once again the discussion was led by those who are living with, caring for and/or working with people with dementia. John Sandblom, one of the co-founders of Dementia Alliance International, told attendees more about the vision of the group in supporting and advocating for those living with dementia. The group is made entirely of people living with dementia and currently has members from the USA, Canada, Australia, UK and Germany. You can find out more about Dementia Alliance International here, which has a fabulous blog, including a monthly dementia research wrap up by Dr Ian McDonald who volunteers his time to do this for DAI. The not for profit group has been running for just over a year now and has achieved a lot in this time. “Collaboration is the key to our continuing success,” Mr Sandblom said, explaining the group has already had a few key successes including becoming a global voice, and advocating to have a person with dementia on the World Dementia Council and Kate Swaffer being invited to present at the most recent World Health Organisation Ministerial Conference on Global Action Against Dementia. Karen Hutchinson also spoke about the importance of supporting children of parents with Younger Onset Dementia. She highlighted the challenges around kids as young as 10 years of age being impacted by the disease and having to take on the role of carer. “Children of people with YOD can feel invisible, outcasts, disconnected and disadvantaged,” and they should not be forgotten when policies are being created around dementia Ms Hutchison said. “We need to involve people with Younger Onset Dementia in service design, development and evaluation from the start” – also emphasising the importance of inclusion. One client of the program said it is an amazing resource as they see me as a person, not a statistic, and the program truly helps me live well with dementia. Grace O’Sullivan spoke about putting human rights at the heart of dementia care and shared her thoughts from her experiences with caring for her father who was living with dementia. “Maintaining and maximising choice in everyday lives is as much about human rights and dignity, as it is about health care” she said while finishing her presentation. Dr Adrienne Withall from the School of Public Health & Community Medicine at the University of New South Wales also presented at the conference today about her research which focuses on the link between head injuries and the early onset of dementia. “We can say with confidence that a significant head injury, one that results in loss of consciousness, or fracture, increases your risk of dementia. “However, there is insufficient research to know the long term effects of milder head injury, such as concussion,” Dr Withall said acknowledging the importance of further research in the area. Finally, Mr Glenn Rees AM, was officially welcomed as the new Chair of Alzheimer’s Disease International taking over from Dr Jacob Roy (both pictured). Mr Rees acknowledged the work of Dr Roy and the Alzheimer’s Disease International board and said we have come a long way in the past few years. “The kind of change we want is still dramatic, and I look for your support to do this,” said Mr Rees to attendees after describing he is looking forward to the challenges ahead. May 11, 2015 in Daily Blog.